In the group of Export-Manga we are working daily to offer a better service and give the best of ourselves. Our work is our hobby and our passion. For that reason we focus our efforts on offer the best products at unbeatable prices as we would like to find ourselves, original products of the highest quality directly exported from Japan, from the heart of the same Tokyo. Our customers are our friends, indeed via e-mail or even chat sometimes, we have a close relationship with you and we love to help us to improve for your benefit. So we are open to suggestions, changes in the Web or searching for you the products you are looking for. 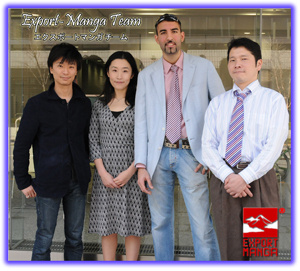 Export-Manga is a young company that was founded with the idea of supplying the growing market for products / goods related to the animation / manga from Japan. In this catalogue can be included from manga, anime books and artbooks to any item or article such as a watch, a T-shirt or a toy. Our concept of the company is to buy and personally guarantee the authenticity and quality of our shipments from the very heart of Japan. The people who form this group are not only simply experts on the world of manga and anime, but also great lovers of Japanese culture. That's why our concept of enterprise is more familiar and traditional. And we want that people who buy our products feel that they are really buying from the traditional Japan. That’s why we will include very soon in our website and catalogue cultural references related to the series / products that the customer purchases. No matter how powerful we may be fighting-wise a system where all the parts react the same way is a system with a fatal flaw. Like individual, like organization. Overspecialization leads to death.